This article is about the operating system called WEE. For the handheld device made by Apple, see Wii. 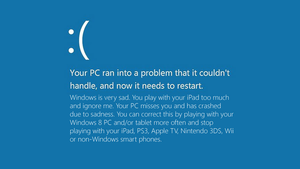 Windows Error Edition (WEE; codename Windows 8) is Microsoft's current top priority and the next version of the Windows operating system, scheduled for release in December of 2012. In late 2009, Bill Gates said in an informal interview with Uncyclopedia News Network that he was "excited that [he] could finally develop and unleash the horrible beast that [he] wished [he] could have unleashed decades ago". During the interview, he promised more variation in the randomness of critical stops, more frequent blue screens of death, an improved red screen of death that we previously only had a taste of during boot time, and several other surprises that could be downloaded as updates or purchased from the Microsoft.com website. "Everyone seems to thrive these days on dark, chaotic games, so we thought it might be a good idea to give them that in real life, too," said Gates. "We've been working on this ever since the conception of Windows," he said. "It has code from all the operating systems we've released so far-- 7, Vista, XP, Me, 2000, 98, 95, 3, 2, and 1. Our philosophy here at Microsoft says that not all the best things happen at the same time, but rather, are spread out through all of what we do, so we went and gathered up chunks of code from all our operating systems and put it all together. Boy, was I pleased when our lead compiler reprogrammed the compiler to ignore all the errors-- now we can release operating systems with errors that don't even happen because the code for them won't work!" "The only reason we've waited so long to release it is because we weren't initially satisfied with the quality of Windows Error Edition until now," Gates continued. "However, with the memory utilization schemes from Windows Vista, the recursion from Windows XP, the intense load on the video card from 7, the randomosity of Me, and the sheer difficulties of doing simple everyday tasks posed by the legacy 9x systems, I think we have a solid Error Edition now. Plus we're meeting one of the most popular demands at Uncyclopedia-- now they can finally have that red link filled in that's sitting on hundreds of articles." Gates stopped speaking once he realized our reporter was carrying a cassette recorder. They are always there, even when you don't want them there! By hacking into Microsoft Corporation's network, the staff at Uncyclopedia have been able to discover what features will be introduced in Windows Error Edition. Boot time will be reduced to microseconds. By doing so, hardware introduced prior to 2012 will have troubles keeping up with the operating system, causing all sorts of exciting new missing device errors, such as "memory not initialized", "hard drive cold", and "electrodes taking too long". 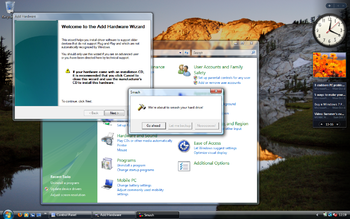 Clippit, formerly part of the Office package, has been re-employed by Microsoft, this time as a "desktop assistant". Clippit comes preloaded with exciting new high-definition animations and higher bitrate sounds. Clippit is programmed to listen to your complaints as you yell them and respond with helpful Bing search results, making full use of your microphone's, processor's, and network card's abilities the entire time your PC is turned on. An error has occurred and this blue screen is here to inform you of that. Don't worry, we programmed this error to display every time you do what you just did. I'm bored. So here's an error. I'm sorry, Bob. I'm afraid I can't do that. This is a new shade of blue. 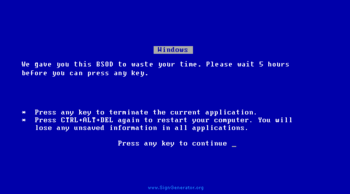 If you like it, please contact our Blue Screens of Death department and let them know. The red screen of death, previously only shown during boot time, is new and improved. Now boot time errors can happen during the shutdown phase as well. New color schemes are being tested in screens of death, including one with hot pink letters on a chartreuse background. Errors can now cause other errors to happen. Windows Task Scheduler is automatically scheduled to open back doors whenever you go online. Windows Update keeps your up-to-date with patches that make your computer more vulnerable and make your firewall and anti-virus easier to penetrate. Thanks to cloud computing, system file are stored on a remote server in India where they cannot be accessed during power outages or server hiccups. And thanks to the red screen of death, when you're working, the computer will cause errors and will send your saved password into the web so other hackers will stole your craps and other things. Windows gets sad sometimes you know. This page was last edited on 3 September 2012, at 08:53.